Luthiers Calgary | About Us | V.A. Hill Fine Strings Ltd.
Meet the Staff at V.A. Hill Fine Strings Ltd.
At Calgary’s V.A. Hill Fine Strings Ltd., we are very proud of our professional, fully qualified staff and our in-house luthiers. You are invited to drop by the shop to visit us in person. Vickie's violin career began in 1985 by assisting in violin and bow repairs being done in the family's workshop located in their backyard garage. As time and her knowledge progressed, she became involved in customer service, bookkeeping, and inventory control. She eventually found herself giving up a 23-year insurance career to take a full-time interest in the violin trade. What started out as a hobby to Vickie became V.A. Hill Fine Strings Ltd., Calgary's largest and best-selection violin shop. 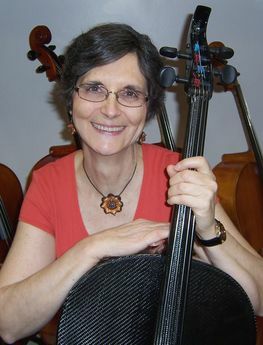 Vickie's extensive knowledge of violin construction and restoration, along with her dedication to precise set-up and repair technique, provides the basis for her demands of excellence in shop standards. With this knowledge, Vickie has been able to hand-pick only the highest of skilled professionals that share or exceed her vision. Vickie enjoys hobbycraft, gardening, and the wild critters in her backyard. Stephanie comes from a military family and calls Victoria, BC her hometown. 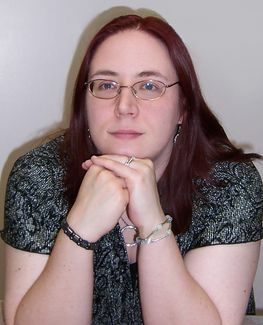 Throughout junior and senior high school, Stephanie was involved in various music endeavours involving clarinet, percussion ensemble, and vocal jazz. She served as Concert Mistress for the final two years of high school. Stephanie earned her Legal Secretary Honours Diploma with a 4.0 G.P.A. and has taken two years of a psychology degree which she hopes to complete in the future. Stephanie has taken charge of numerous managerial tasks at our shop, including bookkeeping and the maintenance of our website. Her administrative and customer service skills, along with her music background, make her a valuable asset to V.A. Hill Fine Strings Ltd. It is the intent that when Vickie retires (a few years from now), the business will remain in the family and Stephanie, her daughter-in-law, will take over as General Manager. Kristof enjoys meeting new people and loves to talk with them about music. He has a talent for working with our customers to assist with choosing their perfect violin. Because he is also a violin teacher, he is able to impart a great deal of knowledge and does so willingly. Kristof’s father, a prominent violin teacher in Calgary, introduced him to the violin at the age of 4. Since then, music has become his passion. Years of classical training have earned him his Grade 8 RCM certificate, work as a violin teacher, and many freelance gigs in and around Calgary. 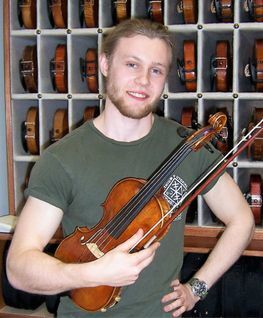 Playing violin has also provided Kristof with many opportunities to perform with local orchestras and string quartets. Kristof is currently pursuing a music degree at the University of Calgary. In his spare time, Kristof enjoys playing piano and guitar, and skiing in the Rocky Mountains. Velik grew up in a musical family in France. 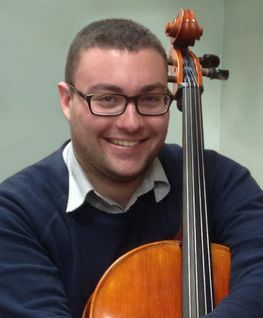 He began playing the cello at age 4, and at age 12 was accepted into the National Conservatory of France, where he studied until moving to Canada in 2010. In addition to playing with various orchestras and chamber groups as a cellist, Velik also enjoys playing piano. He is passionate about most genres of music, including classical, jazz, fiddle, classic country, and classic rock. Though Velik is our newest staff member, he has already formed strong relationships with our customers. His years of experience in music have helped him work with teachers, students and professionals alike. He finds great satisfaction in helping them choose the right instrument, bow, and accessories. His trained ear and genuine enthusiasm are among the assets he brings to our shop. Velik enjoys his 2 cats, Winston and Rupert. Whenever time permits, he can be found at his cabin in Jaffray, BC. Morgan joined our team in 2010. 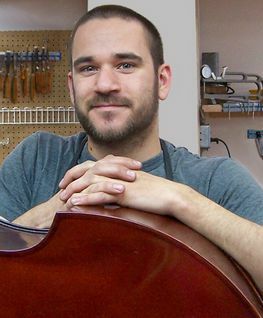 While he is skilled with the repair of all string instruments, double basses are his passion. Word has spread within the double bass community regarding his precision and expertise in set-ups and repairs. Being a professional double bass player himself, Morgan understands the playability requirements of a good double bass. Prior to joining our shop, Morgan had 5 years of woodworking experience in residential cabinetry and furniture refinishing. He also apprenticed with Chuck Shifflett, a well-respected luthier in High River. To date, Morgan has built 4 violins and is now focused on crafting his first double bass. Morgan enjoys cycling and family life with his wife and new daughter. 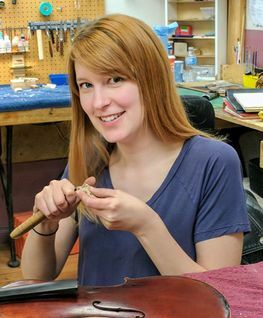 Lianne began her luthiery education at age 17 studying as an apprentice with award-winning violin maker Christopher Sandvoss. She now has 9 years’ experience in the field of violin luthiery. Lianne’s first experience with music was learning the piano at age 12. When she started working with Christopher, she decided to also learn the violin. She quickly gave up playing the violin in favour of making and repairing them, where she felt her talent was far better directed. Lianne has crafted three violins, two violas, and a cello. Lianne has completed a photography certificate from SAIT and continues to be involved in youth outreach programs. In her spare time, Lianne’s dog Zoey takes her for frequent walks. Lianne also enjoys cooking, hobbycraft, and watching movies. Robert (also known as Bert) is the main bow man at V.A. Hill Fine Strings Ltd. Bert’s background includes studies at Victoria Conservatory with award-winning bow maker Michael Vann, and at Claremont College of Los Angeles with award-winning bow maker Lynn Hannings. 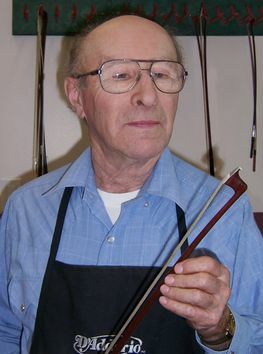 Bert has also completed advanced bow repair and restoration workshops at Oberlin College, Ohio with Rodney Mohr, David Orlin, and Jerry Pasewicz. He has recently presented his own quartet of bows in competition at the VSA in Portland, Oregon. Bert is a collector of luthier-related materials and has an extensive collection of reference books and specialized tools concerning the making and restoration of fine bows and violins. Bert lives in the small community of Acme, Alberta.